Hi could you post directions to this sector please? And is there a topo for the El Solarium sector? Hi Alex, the access to La Cova de L'Escaleta and El Solarium is as follows: from Camarasa follow the C-13 north, passing through two road tunnels where the road crosses the Camarasa reservoir. The parking area is on the right, just after the second tunnel (about 3.5km from Camarasa village). There are actually a couple of parking places on the dam wall between the tunnels, but these usually get occupied early. On foot, walk back down through the tunnel/s. About 20m beyond the entrance of the lower tunnel a path starts on the right. Follow this (very exposed in places) until directly below El Solarium then take one of several side-paths up to the sector (about 10-15 minutes from the parking area). For La Cova de L'Escaleta, either continue along the lower path for a further five minutes or follow the terrace directly below El Solarium leftwards to reach the sector. Are these the crags on the other side of the river opposite La Selva? Yes — almost exactly opposite La Selva. They get the sun all day so are perfect for winter (unless there is fog). Loks really nice - wil be visiting during easter stay. Where can the topo for El Solarium be found if not i LLeida Climbs? 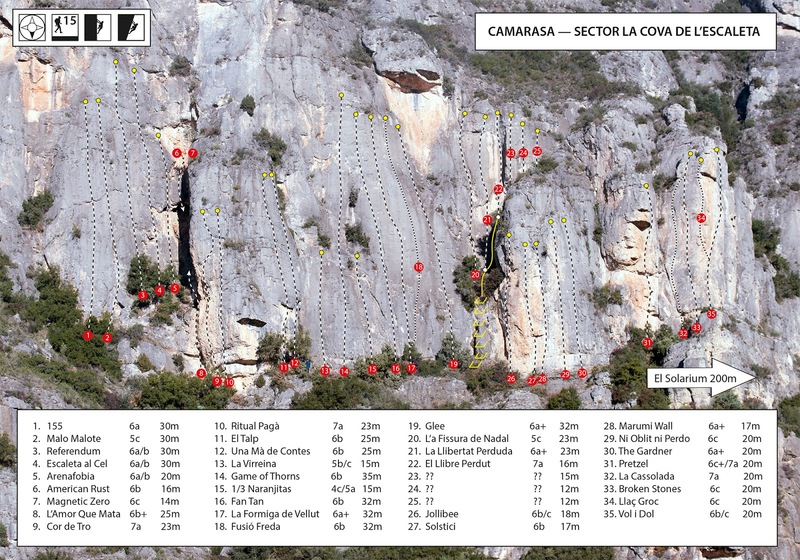 Hi Peter, I think you'll really enjoy the routes at La Cova de L'Escaleta and El Solarium. If it happens to be too hot to climb in the sun over Easter (which looks distinctly unlikely at the moment) then there are plenty of excellent shaded sectors in Camarasa to turn to. The reason I haven't published a topo to El Solarium is that although I equipped some of the routes, the majority were established by local climbers and I need to check that everybody is OK with me going ahead. I also need to check a few details of names and grades. Hopefully I'll be able to post something soon. A few newer routes are missing and several of the harder climbs have been downgraded, but it will get you started. Have a good trip! Hi Andres, Glad you liked the routes! I'm currently back in Sheffield (UK) but I'll check it out on my next trip.